**FREE PREVIEW** Colby Conway dives deep into the numbers to let fantasy baseball owners know what they can expect from the Nationals' shortstop during the 2019 MLB season. 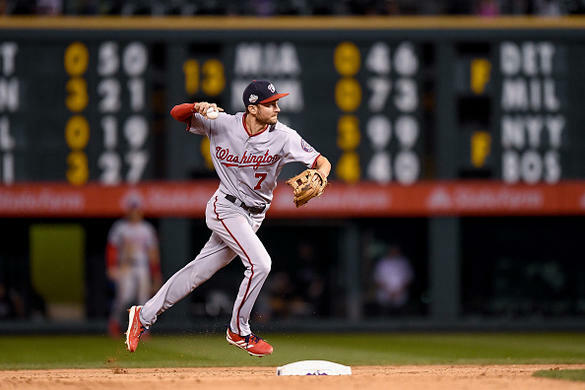 Fantasy baseball owners got what they wanted from Trea Turner in 2018 when he played in all 162 games, but some of the counting stats didn’t quite live up to what many thought. After swiping 46 bags in just 98 games in 2017, Turner swiped just 43 in a full season’s workload last year. While 43 is still an exceptional number, fantasy owners who took Turner early in drafts were hoping for at least 50, perhaps even 60 or more, given what he did the years prior. It wasn’t all “doom-and-gloom” in 2018 for Turner, as he was able to post career bests in home runs (19), runs scored (103), RBI (73) and walk rate (9.3%). Turner’s BABIP dropped 15 points from the year prior, and was 20 points below his career mark, but a spike in the walk rate actually helped Turner post a .344 OBP, which was six points higher than his 2017 mark. His line drive rate jumped a few percentage points, yet remained consistently lower than the 25.2% point from 2016. However, that’s likely expected, as that 25% mark wasn’t going to be repeatable, considering the fact that he hits the ball on the ground nearly half of the time. While some fantasy owners may view Turner as a marginal return on investment last season, it was still a very productive season for the young shortstop. At just 25 years young, he’s continuing to adapt to the big league game and has yet to reach his full potential. Washington is committed to letting him run 50+ times per season and the potential vacancy in the middle of the Nationals’ lineup may allow Turner to run more in 2019. If so, Turner could prove to even be somewhat of a value in the middle of the first round. Believe it or not! Turner hit .271 with 52 extra-base hits in 2018, despite registering the lowest BABIP (.314) of his career, minus the .296 mark he posted in just 27 games back in 2015. His wOBA remained respectable at .331, again, thanks to the walk rate. Turner hit more line drives last season and his spray chart was more pull-heavy last season than prior year’s, but he’ still using center and opposite field nearly 60% of the time. A progression to the mean for his BABIP would indicate a 20-point jump in 2019, which would be excellent for the Nats and Turner’s fantasy owners. Can a jump like this happen? Absolutely. The batting average against fastballs is still down from 2016, but it was a nice jump for the young middle infielder. However, the big factoids to take away are the facts that when he wasn’t getting fastballs, he wasn’t overmatched or had his skills depreciate in any manner. In fact, last season, he punished curveballs, to the tune of a .379 batting average and a whopping .515 slugging percentage, both of which were massive jumps from the years prior. 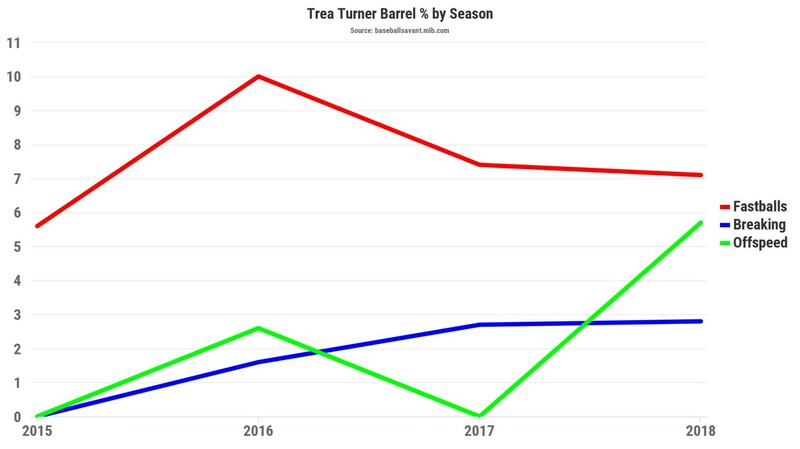 Turner doesn’t chase out of the zone or swing-and-miss all that often, and the continued developments against off-speed pitches will ensure his strikeout rate doesn’t spike too far north of about 18%. The batting average and slugging percentage were able to increase because he was making harder contact on these pitches and barreling them up. Yes, the hard-hit rate and barrel percentage against the fastball has decreased a bit, but the big story here is the improvement against the non-fastballs. 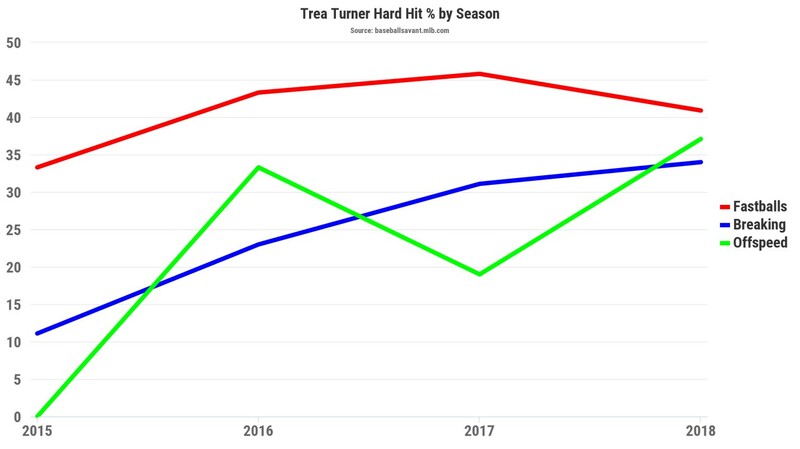 Turner can handle the fastball, which should help that mark increase slightly in 2019. However, his improvement against non-fastballs is key to his continued development in the majors. Steamer projects Turner to hit .287 with 17 home runs and 39 stolen bases for the Nationals this season. Hitting .287 would be excellent for Turner, likely signifying that the BABIP returned to his career mark, and if that were to be the case, Turner has every opportunity to surpass 20 home runs this season. His stolen base prowess makes him a hot fantasy asset, but he is far from a one-trick pony. Turner has a floor of about 15 home runs with 40 stolen bases, but he has upside for 20+ home runs with 50 stolen bases. Drafting Turner in the middle of the first round gives you a huge advantage in the speed category, but his ability to leave the yard and hit for average gives your fantasy team great balance to begin the draft. Turner gives your fantasy team consistency and upside in stolen bases without sacrificing batting average or power numbers.